Are you in Florence this Friday, June 24th? 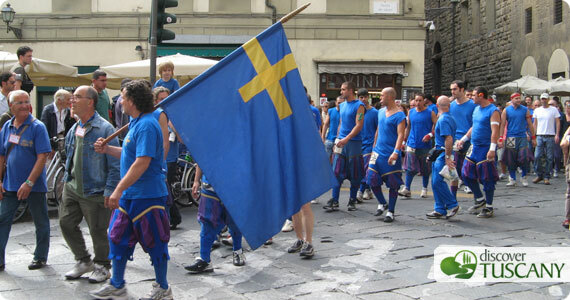 Then take the chance to join in the celebrations for Florence’s patron saint, St. John the Baptist! The big events on this day are the historical parade in costume through Florence that is followed by final match of the Calcio Storico in Piazza Santa Croce and the fireworks show at night. The Calcio Storico is a rough version of soccer played in Florence since the 16th century, and today still played in costume. See pictures of the parade here. The fireworks show starts around 10pm and the best place to see it from is along the Arno river. The fireworks are set up in Piazzale Michelangelo, so be warned that it will be off limits from the afternoon onward. This Friday also coincides with the city’s government new plan to close Piazza Pitti and Via Tornabuoni to through traffic to transform them into pedestrian zones like Piazza Duomo. Another special opening: the tower of San Niccolò, part of the old walls that surrounded Florence at one time located right below Piazzale Michelangelo, will be open to the public. The tower opening is a very unique occasion for both citizens and visitors alike to gain a new view on the city, so do try to visit it if you can. 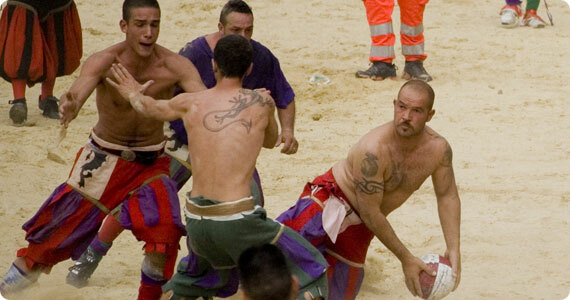 Calcio Fiorentino was an early form of football that originated in 16th century Italy. The Piazza Santa Croce of Florence is the cradle of this sport, that became known as giuoco del calcio fiorentino (“Florentine kick game”) or simply calcio (“kick”).The official rules of calcio were published for the first time in 1580 by Giovanni de’ Bardi, a Florentine count. Just like Roman harpastum, it was played in teams of 27, using both feet and hands. Goals could be scored by throwing the ball over a designated spot on the perimeter of the field. The playing field is a giant sand pit with a goal running the width of each end. There is a main referee, six linesmen and a field master. Each game is played out for 50 minutes with the winner being the team with the most points or ‘cacce’.Originally, calcio was reserved for rich aristocrats, who played every night between Epiphany and Lent. In the Vatican, even Popes, such as Clement VII, Leo XI and Urban VIII were known to play. Whatever you do on Florence, join in and enjoy the celebrations! !